Kentucky stayed perfect in SEC play at 9-0 with their 12th-straight victory, while Missouri extended its win streak to seven matches with a sweep of LSU. Alabama and Auburn each won in five sets. The Wildcats won their 12th straight match to stay atop the SEC standings at 9-0. It was the fifth straight loss for Georgia and the team’s first loss via sweep of the season. Kentucky outdid Georgia in every way, outhitting the Bulldogs .323 to .088 and besting the home team in kills (42-27), aces (7-2) and blocks (11-6). Leah Edmond, Brooke Morgan and Alli Stumler each turned in nine kills to lead Kentucky. Morgan hit at a team-best .462 clip and put up a team-high six blocks. Three Georgia players notched six putaways: T’ara Ceasar, Rachel Ritchie and Majesti Bass, but none hitting higher than .235. Ceasar hit -.071 (6-8-28) and added eight digs. Georgia’s Meghan Donovan posted the lone double-double of the night with 24 assists and 10 digs. Kentucky used an 8-0 mid-set run in Set 3 to go ahead 13-6 and never looked back as Georgia never got closer than five from there. Missouri extended its win streak to seven matches, while LSU dropped its third straight. Mizzou won its fifth straight in the series with LSU and improved to 8-4 all-time against the Tigers. Missouri outhit LSU .312 to .185 for the match, including a .571 to .167 advantage in Set 3. Mizzou piled up 19 kills in the final stanza to just eight for LSU, boosting their match lead to 54-30 in putaways. LSU outblocked Missouri 7-2. Five Missouri hitters notched eight or more kills led by Kylie Deberg‘s 15 putaways. Tyanna Omazic (11), Alyssa Munlyn (10), Dariana Hollingsworth (9) and Leketor Member-Meneh (8) followed. Munlyn hit at a team-best .714 clip (10-0-14). Andrea Fuentes turned in 41 assists and 10 digs. Taylor Bannister was tops among LSU players with eight kills. Toni Rodriguez (7) and Olivia Beyer (5) also aided the team offensively. Beyer hit .556 and put up three blocks. Mizzou built a 9-2 edge including four kills and two aces by Deberg, and cruised to a 20-7 lead as Munlyn chipped in three putaways. Omazic notched the final two points for the Tigers at 24-10 and 25-12. 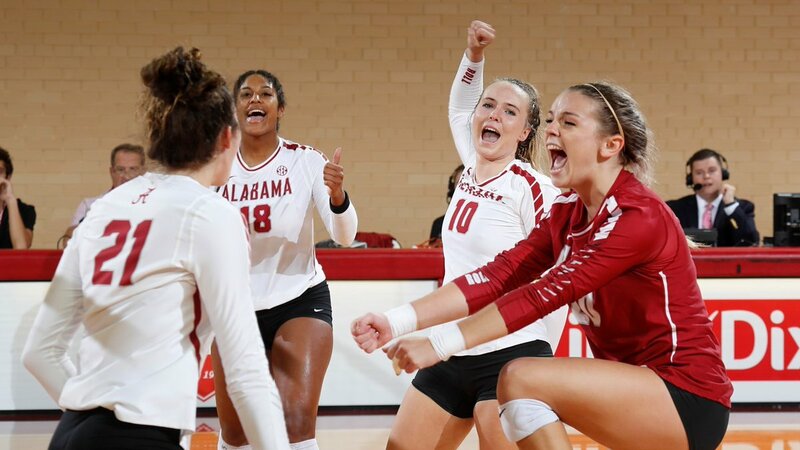 Alabama picked up its second straight road win and third five-set victory of the season. The match marked the third straight five-setter for Texas A&M, following losses to Tennessee and Kentucky last weekend. Texas A&M registered 12 more kills in the match (63-51), but was outhit .201 to .165 and outdone in aces (5-3) and blocks (10-9). Alabama bounced back from a -.133 effort in Set 4 to hit .242 in the final stanza. Hayley McSparin downed 14 kills at a .462 clip and added four blocks to lead the Crimson Tide. Mahalia Swink followed with 10 kills, eight digs and a team-best six blocks. Doris Carter just missed a double-double with nine kills and nine digs. Three Aggies posted double-digit kill tallies: Hollann Hans (19), London Austin-Roark (13) and Makena Patterson (13). Hans hit just .115 for the match, but rounded out a double-double with 13 digs, while Patterson turned in a .393 hitting effort. Camille Conner posted 43 assists, 17 digs and six kills, while hitting .500 (6-0-12). Alabama raced out to a 7-2 lead in Set 5 with help from two Swink kills and three A&M errors. The Aggies were within one at 7-6, but a 7-2 run including three kills and a block by McSparin put the Crimson Tide on the hill at 14-8. A Mylana Byrd kill three points later sealed the victory. Auburn snapped a five-match losing streak with the victory. Tatum Shipes notched 21 kills and six blocks to lead the Tigers to victory, while Brenna McIlroy (18 kills, 10 digs) and Gwyn Jones (13 kills) followed. Anna Stevenson added seven kills and a team-best seven blocks. Emily Stroup posted 18 kills and eight digs to pace the Rebels, while Caitlin Wernentin turned in 12 kills and 12 digs, while hitting at a team-high .345 clip. Auburn outdid Ole Miss in kills (77-59), aces (5-1) and hitting efficiency (.267 to .222). The Tigers started the match with a strong .429 hitting effort then followed with a .163 effort, before bouncing back to hit at least .200 the rest of the way. Ole Miss hit .216 or better throughout the first four sets, but managed a .000 effort (6-6-17) in Set 5. In the 15-12 Set 5 loss, the Rebels trailed 13-8, due in part to four blocks, before rebounding to score six in a row to pull within two at 13-11. Kills by Chesney McClellan and McIlroy cut the comeback short at 15-12.